I say over and over again that LinkedIn has the biggest income per user from all social networking sites. You should include Linkedin in your social media framework because here you can find the most important entrepreneurs, managers and professionals. LinkedIn is a network that you should visit daily for professional development — whatever your employment status may be. Is your LinkedIn profile ready to be seen by others? Here are ten suggestions to give you instant LinkedIn cred. If you don’t have money for a professional photographer, get a family member, roommate, or neighbor to take your photo against a solid colored wall. Try a few standing, then some sitting down. Get a few with a formal shirt, a few with a “business casual” top. Or consider the low-cost approach I took: bartering with a photographer for your services or product. This was by far the best deal I made in my first year of business! Don’t let the positions in the “Experience” section do all the talking about your professional abilities. Many recruiters and potential clients won’t take the time to scroll that far without incentive. How have you excelled at your job? Why do you often get promotions? Why did that last person tap you on the back (or send you an email) with “NICE JOB!”? Find common traits and spell it out in the summary, preferably with numbers or percentages of related increases (of sales) or decreases (of expenditures). Even if you’re not actively looking for employment, review what your most recent entry is under “Experience.” Do you have a new title? New responsibilities? A recent accomplishment that speaks of your professional prowess? Be sure to list those here. LinkedIn allows you to upload images, documents, and videos to each job you list under “Experience.” Why not liven up that section with visuals that show the greatness of which you’re capable? If you’re a graphic designer, professional organizer, or landscape artist, show off your most stunning accomplishments. If you’re a storyteller, community activist, or professional athlete, use video to show your work in action. At times LinkedIn might not seem like it, but it is considered by many to be a social network. Demonstrate your ability to network with like-minded professionals by joining LinkedIn groups. Look at your coworkers’ and competitors’ profiles to see which groups they’ve joined — pick the best of the bunch you find there. By following LinkedIn “influencers,” you give viewers a sense of which thought leaders you respect — whether it be President of the World Bank Jim Kim, industrial psychologist Dr. Marla Gottschalk, or Nancy Lublin of DoSomething.org (or all three). Influencers regularly post to LinkedIn, so you’ll also be able to comment on and share articles that are meaningful to you. It’s surprising how many employees do not follow their own company’s page on LinkedIn. Where’s the company pride, people? Seriously, show that you’re a proud team player and affiliate yourself with your current employer’s page. There is a ton of controversy over the value of LinkedIn endorsements. But you know what? They’re here to stay, at least for the foreseeable future. So use them to your advantage. Make sure that you list only the skills for which you want to receive a thumbs up. Hide skills that will not speak well to the place you are now and the path you wish to follow in your career. Did you sign up for LinkedIn with your work email address? Is that address still valid? It would be a shame for you to do the nine previous steps and then have a potential client or recruiter write to an outdated address. What else do you want to know about LinkedIn? Ask away! Hi, it was a guest post. No it wasn’t a guest post. 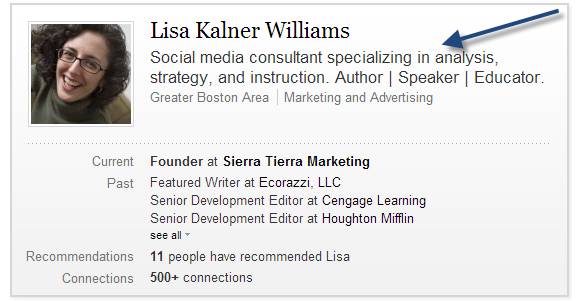 It originally appeared on my blog (http://sierratierra.com/linkedin-profile-improvements/) and then was picked up by Social Media Today (socialmediatoday.com/kalnerwilliams/1700131/10-simple-ways-improve-your-linkedin-profile). I don’t know this site and did not give them permission to repurpose (and reword) my post. It originally appeared on my blog (http://sierratierra.com/linkedin-profile-improvements/) and then was picked up by Social Media Today (socialmediatoday.com/kalnerwilliams/1700131/10-simple-ways-improve-your-linkedin-profile). I don’t know this site and did not give them permission to repurpose (and reword) my post.